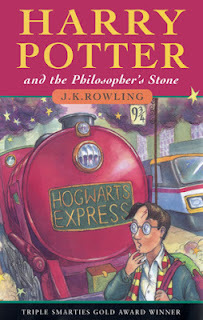 It feels great to have finally read The Philosopher's Stone! Though I thought they were good, I wasn't completely spellbound by the films and hadn't watched all eight until they were shown on the movie channels. But, having then done so and felt their appeal grow on me, I decided it was time to at least attempt to read the books. Sometimes when a book is well-loved by such a wide audience, it can be daunting delving into its pages for the first time because of such expectancy. Thankfully, though, I enjoyed The Philosopher's Stone. Rowling has done an amazing job of creating a hidden world of whimsical magic, I wished for it to be real. I thought, must I live in the Muggle world? Why couldn't I get a letter inviting me to study at Hogwarts? On my next trip to London, should I go searching for Platform 9 and 3/4 at King's Cross Station? And it seems unfair that I can't get an owl to deliver my mail! The book is also very British, which I loved. Even though Hogwarts is an establishment like no other, I was still brought back to my own school days with that beginning-of-year uncertainty, teachers that both encouraged and intimidated, and students who were prefects, head boys and girls, good friends and aggravating classmates, and, of course, those uniforms. However, one thing lost on me was some of the excitement, having seen the film quite recently and remembering the outcome of certain events. Though as with any adaptation, many parts of the book had been changed or left out completely, which meant that some suspense still lingered.